Adsense is a Google program that allows bloggers and website owners to make money by displaying Google ads. You've probably heard of Google Adsense or seen the ads all over the place, including in Google search results. Adsense works with EPC (earnings per click) and CPC (cost per click). Basically, Google gets the largest cut and you get a small percentage. In this article we are going to give you an introduction to Google Adsense and provide some tips for getting the most from Adsense on your websites. Google AdSense is a program run by Google that allows publishers in the Google Network of content sites to serve automatic text, image, video, or interactive media advertisements, that are targeted to site content and audience. These advertisements are administered, sorted, and maintained by Google. Google AdSense publishers can generate revenue on either a per-click or per-impression basis. Pay per click (PPC), also called cost per click, is an internet advertising model used to direct traffic to websites, in which advertisers pay the publisher (typically a website owner or a host of website) when the ad is clicked. Cost per-impression (CPI) is the cost or expense incurred for each potential customer who views the advertisement(s), while CPM refers to the cost or expense incurred for every thousand potential customers who view the advertisement(s). The adverts displayed by Google come from the Google Adwords service. An advertiser also has the option to display their advertisements on the publishing network (websites that display Google Adsense). 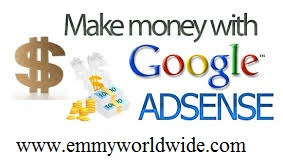 Google Adsense is a quick and easy way to monetize your website. With Adsense you can display text and image ads that are targeted to match the subject matter of a website page. E.g if you create an article covering “MTN TO MTN FREE CALL” the ads from Google Adsense will display MTN TO MTN FREE CALL related advertisements. You earn money from the advertisements on a cost-per-click basis. The amount that you earn per click varies dependant on the keyword and the number of advertisers bidding for that keyword. There are several factors that affect how much you can earn from Google Adsense. Some Adsense publishers earn a five figure income each month whereas others earn a few dollars per month. Your income from Adsense depends on the cost per click for each advertisement, the number of visitors / page views your site receives and CTR - Click through Rate for the ads. You have to earn $100 or more before Google will issue a payment to you. The total is rolled over each month until you exceed $100. The position of the Adsense advertisements is very important for increasing click through rates. Google have created a heatmap to help you decide the best placement for your ads. You are allowed to display up to 3 ad units on a page and a single link unit. If you can, make the most of this and display all of these ads using different combinations of banner sizes and locations across your page. Research has found that the best CTRs are achieved by blending the advertisements to match the style of your website design. For instance, remove all of the borders from the ads and change the colour of the text links to match the colour of the links within your own website. This helps to create the perception that the links are part of the page and not advertisements. Other techniques are to place images alongside the advertisements in order to grab the attention of the visitors’ eye. Be careful with these techniques though as Google is known for banning publishers who try to trick visitors to click on the adverts. Related Posts: Adsense Tips, Make Money Online. Labels: Adsense Tips, Make Money Online.